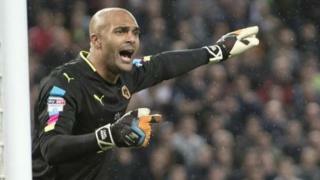 Wolves goalkeeper Carl Ikeme has received support from former footballer Geoff Thomas following his leukaemia diagnosis. Mr Thomas was diagnosed with the disease in 2003 and now raises money for Cure Leukaemia. The former Wolves and England player said news of Mr Ikeme's diagnosis has "refocused everything" for him after a challenging fundraising cycle ride. Mr Ikeme is to begin treatment after his acute leukaemia diagnosis. Mr Thomas, currently completing a grand tour, said: "I was having a bad day on the bike yesterday. I was doing 130 miles in searing heat and I was thinking why am I doing this? I was really contemplating getting off. "But then I get the news and it just refocused everything. "This word leukaemia and cancer gets mentioned and it just stops you in your tracks. You think you're fit and healthy and then you get that news. It's devastating for everybody. "I took so much positivity and support from the world of football and I'm sure that's going to happen." Wolves' managing director Laurie Dalrymple said: "It goes without saying that Carl and his family will receive the full love and support that we at Wolves can provide - we are all with him every single step of the way towards a full recovery."